You may organise the Grade Centre to suit your purposes better. By organising the Grade Centre you may hide certain columns, quickly change column categories and grading periods, move columns, and select which columns are shown before the scroll bar in a similar way to using the split feature in Excel. 1. 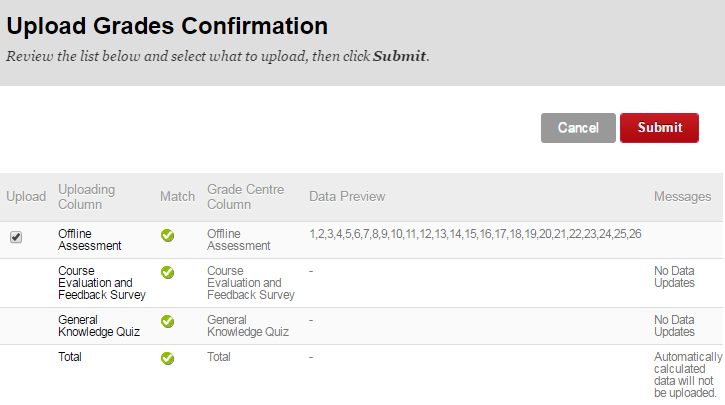 Access the Grade Centre from your course Control Panel. 2. Hover your mouse pointer over Manage, a menu will appear, choose Column Organisation. 3. 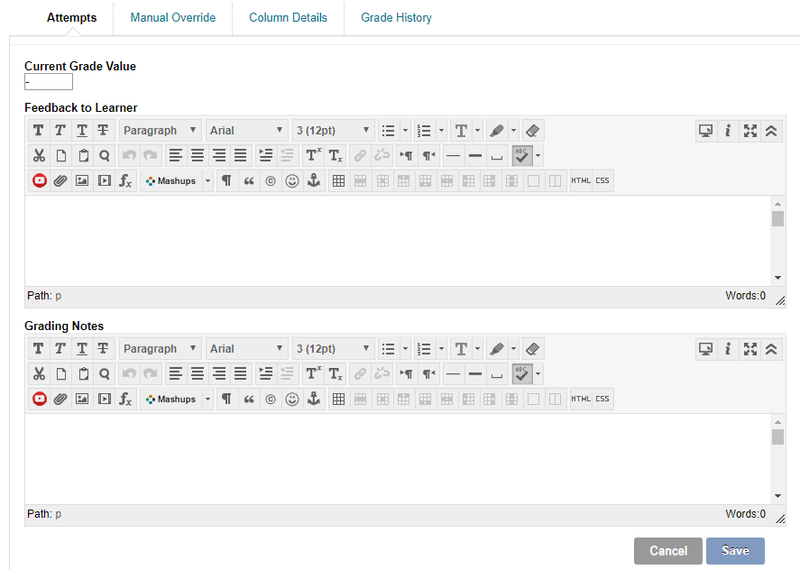 The Organise Grade Centre screen has buttons labelled Show / Hide, Modify Category, and Modify Grading Period. 4. 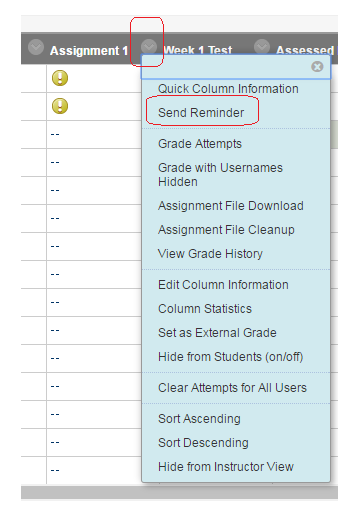 Each of your gradebook columns are shown below, starting with information shown in all views, then information by Grading period. 5. Columns are selectable by placing a tick in the tick box beside them. 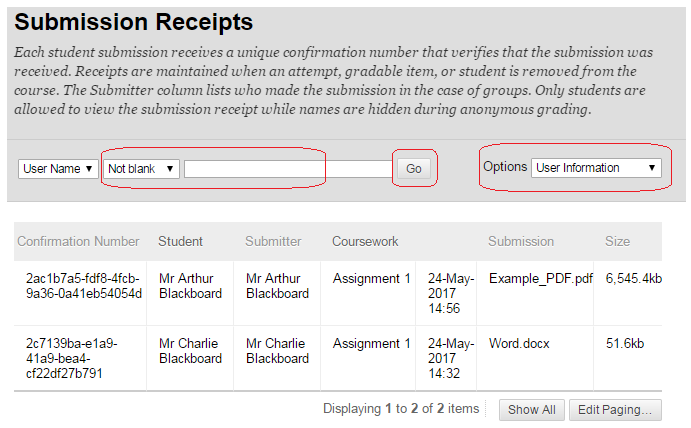 Note: columns in the Grade Centre are in fact shown as rows in this organise screen! 6. To show or hide a column within the Grade Centre select it by placing a tick in the corresponding tick box then hover your mouse over Show / Hide and choose the relevant option. Note that if you hide a column it will be hidden in the Grade Centre only, it will not be hidden from students. 7. To quickly change the category of a column select it by placing a tick in the corresponding tick box then hover your mouse over Modify Category and choose the desired category. 8. 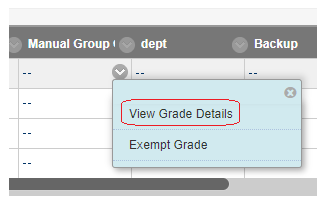 To quickly change the grading period of a column select it by placing a tick in the corresponding tick box then hover your mouse over Modify Grading Period and choose the desired period. 9. To quickly change the position of a column, hover your mouse over the arrow icon then hold the left mouse button and drag the mouse upwards or downwards to move the column. 10. In a similar way to Microsoft Excel, it is possible to “freeze” columns so that they do not move while scrolling through the grade centre. In the Grade Centre the Freeze Bar fulfils this function. To move the freeze bar simply click and drag the freeze bar to the desired position. 11. After making any changes click the Submit button. 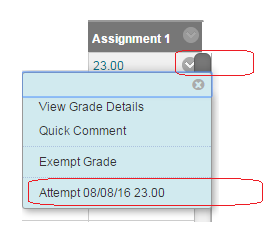 If you wish to manually add an override grade, follow these instructions. 2. Find the column and corresponding row into which you wish to enter a grade and click on it. 3. The cell will become active. Type in the grade and press ENTER. Note that information about the column appears in the grey box below. 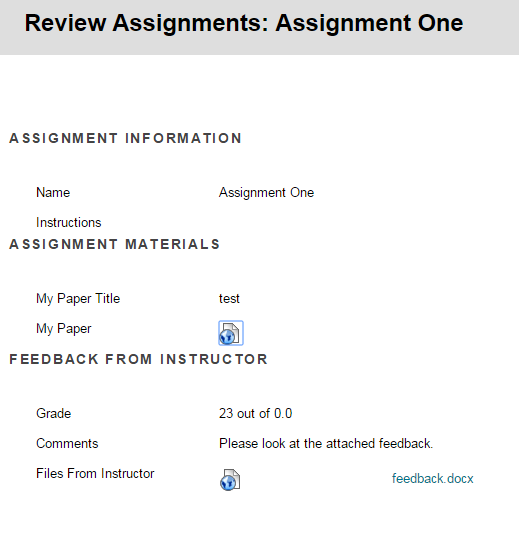 This will usually be an override grade. 4. Note that if you do not press the ENTER key after typing in the grade a dialog box will appear asking if you wish to save the entry, selecting OK will save the grade. 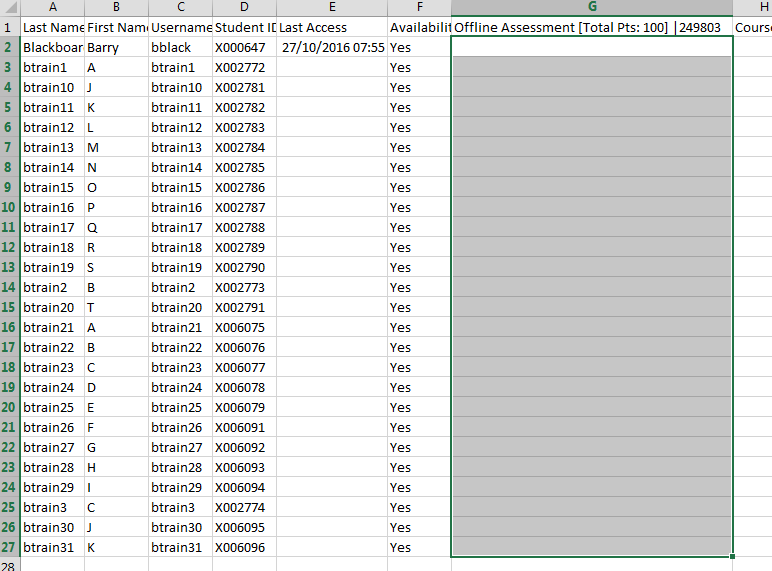 You may set the Grade Centre to automatically apply colour codes to cells based on criteria that you set. This is similar to conditional formatting in Excel. 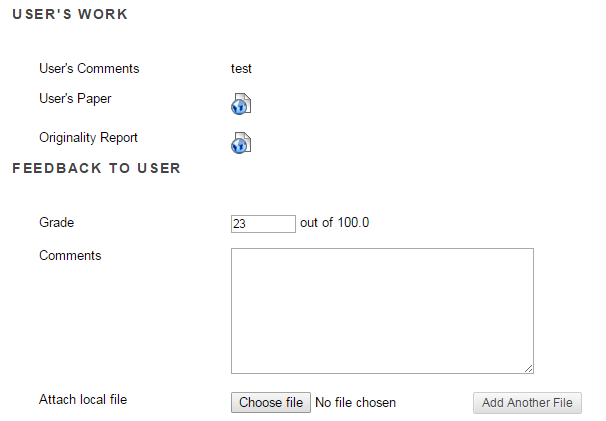 This feature can be useful to quickly identify good or poor scores in a large cohort. 2. 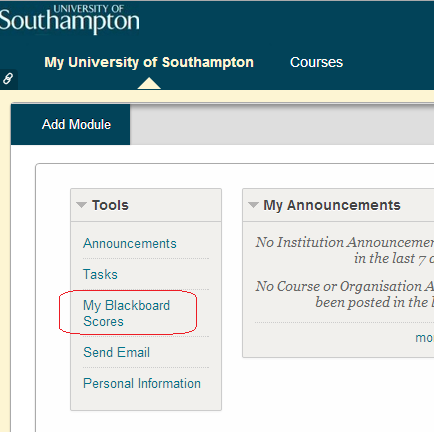 Hover your mouse pointer over the Manage button and choose Grading Colour Codes. 3. Tick the box to Enable Grading Colour Codes. 4. If you wish you may set a colour to quickly show attempts that are in progress, need marking, or are exempt. There are already icons for these so this is less useful. 5. 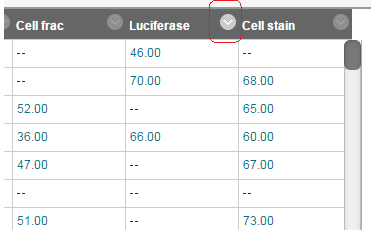 Next you may set criteria for the colour used within cells that meet the criteria. To add a criteria click on Add Criteria. This screenshot shows an example of how the criteria may be set up. 6. Click on Submit to finish. 7. 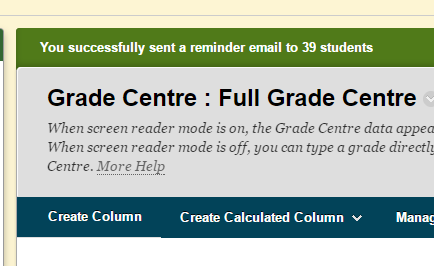 Here is an example of how the colour codes can look in the Grade Centre. Categories allow you to classify Grade Centre columns. These can be helpful to organise a large number of columns. It is possible to use categorised columns when setting up calculated columns, creating reports, and using Smart Views. To set up categories follow these instructions. 1. 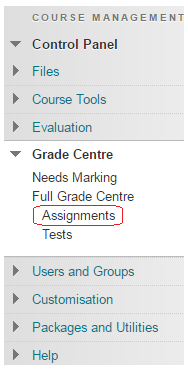 Expand the Grade Centre section of your course Control Panel and click on Full Grade Centre. 2. Hover your mouse pointer over Manage, a menu will appear, choose Categories. 3. You will be presented with a list of existing categories which you may Edit or Delete by clicking on the corresponding modify button. 4. If you wish to add a new category click on Create Category. 5. When adding a new category you will be asked for a Name and Description for the category. 6. 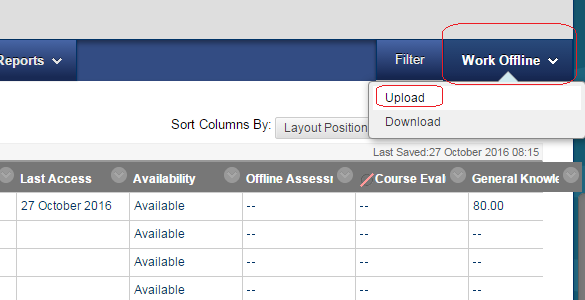 If you wish to categorise Grade Centre columns, simply click on the arrow icon next to the name of the column and select Edit Column Information. 7. The category can be changed using the drop down menu in the first section as shown. When creating new columns the category may be chosen in the same way when initially creating them.